MC+ engine oil stop leak works overnight to end drip. And then takes a unique approach to making it a more valuable stop leak by continuing to stop the 2 conditions that cause leaks - no other product does. Fluid leaks start from combustion "blowby" - which is acidic. With heats, its acids shrink seals and gaskets making them leak. its your leak problem. The picture shows how dirty-motor conditions internally starts blowby and those ugly oily drips on your driveway. And you thought oil changes prevented such troubles - Ha! Not so. This blowby becomes important to stop, along with your stop leak effort, as you shall see. As your engine transmission steering and A/C ages, blowby, acids, and heat causes most other types of troublesome damage to your motor, also. So, blowby is a factor you will want to consider stopping, also. Drip and leak ending products and methods and cost. Additive stop leaks sold in part stores, gas stations and quick lubes are cheap, bur mostly harmful. And common repair cost to stop leaks run to $3500. We found one brand - Mega Power, that isn't harmful! Is cheap and is your best choice! A DIY fix. Which gives them a controlled expansion, which stops your leak. Then fills and smooths acid pitted and friction worn piston bearing valve and gear surfaces. All that is what Mega Power ends that causes harm - stopping your seal leak. Start adding Mega Power to your vehicles to gain these car/money saving advantages! Order here. Stop Leak results always are impressive! Mega Power Product Install runs about $499 for big truck engines and gears, with stop leak. Just $399, if you install it. About $200 for cars if you have a shop install it. Under $100 if you do the simple install. A permanent fix! If you feel like most car and equipment owners you need Mega Power's triple conditioning superior stop leak feature and engine protector! Order here for cars and pickup engine leaks. In gallons size for big rigs and equipment. Order Now! Shipped with simple install directions to your door in 3 days, phone help if needed, guaranteed to satisfy. Car pickup size shown here. Order the Mega Power Engine Oil Stop Leak Treatment described. 6 items as shown. For cars pick ups. Excludes metal feeder bottle - sold to mechanics who install Mega Power every day. Not needed for stopping leaks. Includes easy to follow instructions. Phone help. Guarantee. Shipped to your door in 3 days by FedEx. Just $85+ $14s&H= $99 total. Spring Protect your car Bonus: Also includes our Transmission stop leak preventer. $39. Free for a limited time. Order click button. 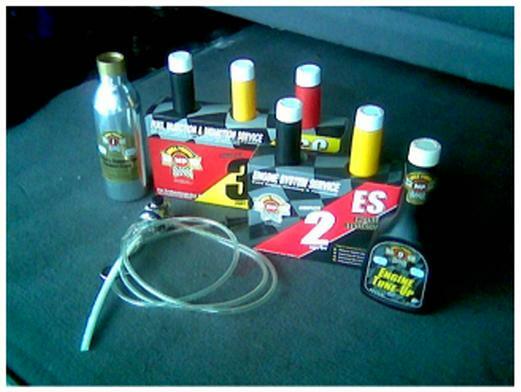 Protect both vehicles and save even moreQ Two MP Engine Oil Stop Leak Treatments for both your vehicles. Perfect to prevent problems in your good car. 14 items total. $135+ $14s&h= $149 total. Save $48 on 2 engine sets for 2 motors. Limited time offer. From Mega Power their patented engine oil stop leak treatment stops leaks using MC+ and other ingredients, overnight. No filler. No solvents like other stop leaks have. Mega Power expands and conditions to stop O rings, oil pan gasket, head gasket, crank and shaft seal drips. Does not swell them -which weakens them. Guaranteed! 6 items make up the stop as a treatment which also stops compression blowby - the one cause of the leak by increasing crankcase pressures from negative to positive 5 to 10 lbs. Negative pressures are normal. Positive pressures increase chance of leaks. Acids shrink the rubber in seals making them leak. And Mega Power by neutralizing acids ends the problem giving the seal and gasket a slight controlled expansion to stop their leaking. Then healing, smoothing, and filling acid pitted surfaces. for a second power preserving boost. The usual way to stop and oil leak is by adding a part store engine oil stop leak. They contain a solvent that swells leaking seals to stop the drip. Those type additives are known to produce harmful, wear-increasing side effects and weaken the seals in today's hi-tech motors. A new engine oil stop leak and conditioner - from Mega Power stops your seal & gasket leaks without causing them to swell like all other stop leaks do - using solvents. Swelling deteriorates seals and gaskets. Instead, Mega Power conditioners revitalizes your motors seals and gaskets elasticity - - elasticity is the rubbery expansive nature that gives your motor - and transmission seals their ability to push against the oppsite surface - their sealing ability. Mega Power found that combuston "blowby and acids" take away seal elasticity, shrinking them such, oil seeps pass the seals and gaskets and drips on your driveway. Mega Power stops the seal leak overnight. And the Mega Power Stop Leak Treatment contains conditioners end the 2 causes of seal and gasket leaks - ending excessive combustion blowby, and neutralizing acidic conditions - both causes of seal and gasket shrinkage and oil leaks. This new stop leak chemistry is an engine anti-wear. This help from Mega Power, also gives your motor drip free results - and what seems like an enduring tune up - customers, tell us, that last for years! "On my year old Ford diesel pick up - the treatment stop the oil seal leak; the dealer couldn't!" "Stop my oil leak in about a day of driving. No more oil plotches on my driveway to track into the house." 98 Honda owner - "no longer burns or loses 2 quarts of oil between oil changes. The mechanic said, "$2000 would fix it." Mega Power stopped the leak and restored its power in less than 24 hours - and its been running great since then - for less than a $100, not $2000"
"Stop my valve lifter tap in minutes when a synthetic oil change couldn't." "I bought my Chevy Astro Cargo Van with 124,400 miles on it. Your oil change treatment ended its sluggish ways, a rough idle, oil leak, and it quit using 2 to 3 quarts of oil between oil changes. I thought it was worn out! I thought a new motor was needed!" The cause of oil leak problems. Because your motor works in a very acidic condition - those acids causes seals and gaskets to shrink and leak oil. Acids eat away the smooth surfaces of your pistons, bearings, valves, and gears. If not removed they go on to cut in half your remaining engine life. Acids come from sulfur in fuel and oil - which form acids with Hi-temperatures and moisture in your motors combustion process. As your motor -and transmission age, they tend to run hotter, dirtier, and accumulate harmful acidic residues. Residues collect of your motors piston rings and valves. Sticky fuel intake and exhaust valves reduce full combustion and this lowers your motor horse power by as much as 10%. Sticky piston rings causes them to fail to flex outward to seal combustion above your piston. Escaping pass sticky piston rings combustion - with its acid nature mixes in with the motor oil below. We call that "blowby." There in the oil, circulating for thousands of miles, acids attack and etch away the factory smooth surfaces of your pistons, bearings, valve stems, and gears - causing their surfaces to wear faster. More friction and resistance occurs absorbing power that use to go to the wheels. Mega Power stops those problems! Acids seep into seals and gaskets causing their polymers to shrink - permitting oil to now leak out. Mega Power ends leak problems. Mega Power research developed a treatment found to stop seal and gasket leaks and end all three of your engine and transmission leak-caused problems - not just stop engine seal leaks. 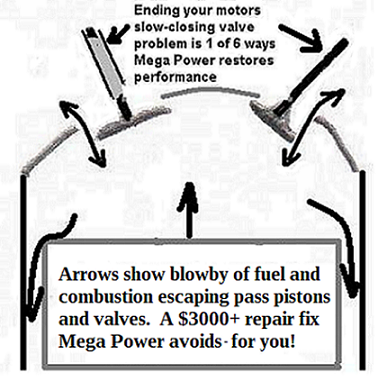 While an engine repair and overhaul to correct such problems run $3000, you can install Mega Power easily, yourself. Cost is $65 plus shipping. Order Mega Power now - get on down the road of life in a better running, leak free car. Engine oil stop leak from Mega Power. Since so much of Mega Power's benefits helps your motor to actually stop the cause of your engine oil leak - and the leak, and also end what is shortening your future motor life, Mega Power's Engine Oil Stop Leak is really a good choice for your motors years longer life too - wouldn't you say? That is a much better option for most car owners, of course, and is the cheapest best way to end your leak problem - besides a $3000 engine overhaul - which hands cleans every part, and replaces rings and valves and gaskets and seals, in the process. Mega Power's new product Engine Oil Stop leak, shown below, will neutralize acids in seals and gaskets. A conditioner relaxes the rubbery stiffness - allowing the seal and gasket to expand back to its original shape, stopping the leak. Mega Power's engine oil stop leak neutralizes your motor and fuel acids, cleans and frees your dirty, sticky rings and valves - as a power restoring extra benefit stop leak aid. Mega Power MC+ metal conditioners also heals and smooths your acid roughen piston, bearings, valve stems, and gear surfaces - changing them from rough to smooth again. This advantage stops the loss of horsepower from abrasion and friction. That lost power is freed and now goes on to speed you faster down the road. Those are the tune-up-like-improvements gained as you stop your engine oil leak with Mega Power Engine Oil Stop Leak. Order Mega Power for all your vehicles and enjoy better running, zippier performing vehicles, years pass what others enjoy, while stopping and preventing engine oil leaks and their aging power decline negatives. Your motor really needs this product. It crying-for-help... Order the Product now! I'm here to walk you or your mechanic thru the simple installation by phone if needed. Order 6 MP Engine Oil Stop Leak Treatments 36 items. $300+ $15s&h+ $315 total. Save $180. Fleet care and auto repair resale directly from your inventory. Order a Treatment for your motor $99, and a similar Treatment made up of 3 products - The Mega Power Transmission Service #TS3 $75, for the transmission, you want to protect: Just $125 for both sets, plus $15s&p= $140 total. [Regular price for both $174] Save $40. Engine oil stop leak help. Shipped Fedex or USPS with 3 day delivery to your door. Say, "You want to order the Mega Power Engine Oil Stop Leak Treatment Special." Visa M/C. Comes with easy to follow instructions, guarantee. My personal help by phone. I'm a mechanic.